Vogue, “Now, with its first ground-level location in Williamsburg, Brooklyn." WIRED, “Yoga Blocks That Look Like Art...folks from Sky Ting Yoga in New York–tested the shapes." Time, “SKY TING'S 10-Minute Yoga for Tight Hips"
The New York Times, “Krissy and Chloe are dynamic, dedicated teachers that have created a space to explore yoga in an informative and supportive environment." The Lifestyle Edit, “It's so much more than down dog!" Coveteur, “SKY TING YOGA brings us back to the basics." Loeffler Randall, “With programs and workshops ideal for all ranges of yoga expertise and personal preference, this studio has it all." Fashionista, “This is yoga without any of the yoga pretentiousness"
Vogue.com, “ Yoga for the Relentlessly Optimistic"
CAP Beauty Blog, “When you feel good, you emanate beauty from within." mindbodygreen, “...an authentic approach to mentoring yoga teachers..."
Vogue.com, “...many a Vogue editor swear by the classes Krissy Jones has been teaching..."
sporteluxe, “Yoga is not a fitness program, at least the yoga I teach and believe in, but it is a wellness program." The New York Times, “Fashion’s favorite yoga trainers..."
L'Officiel, “Instead [of trends] we're really interested in the functionality of the body and giving our students tools and techniques to enhance their lives..."
Well+Good, “Breaking: SKY TING YOGA Is Headed To Brooklyn"
SELF, “...get ready to feel zen after just ten minutes." Glamour, “12 Secrets of Women Who Switched to Natural Beauty Routines"
mindbodygreen, “...bringing us all back to what yoga is really about: community, love breath, and movement." Byrdie, “...I felt right at home." Vogue Girl Japan, “...it is filled with the feeling of wellness in New York now." Violet Grey, “I'm a huge fan of SKY TING yoga." Well+Good, “It's an incredible workout and very restorative. I love the overall vibe of the studio." FOR NEW YORK, “...we know the power and beauty of creating a strong community!" Amuse, “[Yoga] doesn't have to identify with a single culture, rather it can be applied in every culture to bring a little more ease and a little more joy." Forbes, “...Sky Ting's aim of an inclusive studio blended with minimalist design made this brand a hot-spot for yoga enthusiasts." Harper's Bazaar, “...at SKY TING, they don't want to send you home at all." Well+Good, “...their second location has even more room for practicing—and socializing—than the first." Outdoor Voices, “..find new ways to stretch, bend, and play." Elle.com, “I fell in love with this yoga class..."
W Magazine, "Infrared saunas are amazing for relaxation, releasing toxins, and they really help revitalize my body in general." Vogue.com, “...SKY TING's distinguished, down-to-earth teachers are perhaps what separate it most from its many neighbors." yoga journal, “...their methodology is a unique hybrid of highly transformative yogic material steeped in geometric alignment principals, pranayama, meditation, and Taoist studies"
Vogue, “How Downtown's Coolest Yoga Duo Hits The Beach"
OKREAL, “There's a joyful, lightness to our [SKY TING'S] practice–we're serious about it, but we like to have fun with it too." matchesfashion.com, “Chloe Kernaghan shares her favourite places to eat, explore and escape the demands of city life." hey woman! “...there was a need for a different type of studio—a place that's well-designed and non-dogmatic." 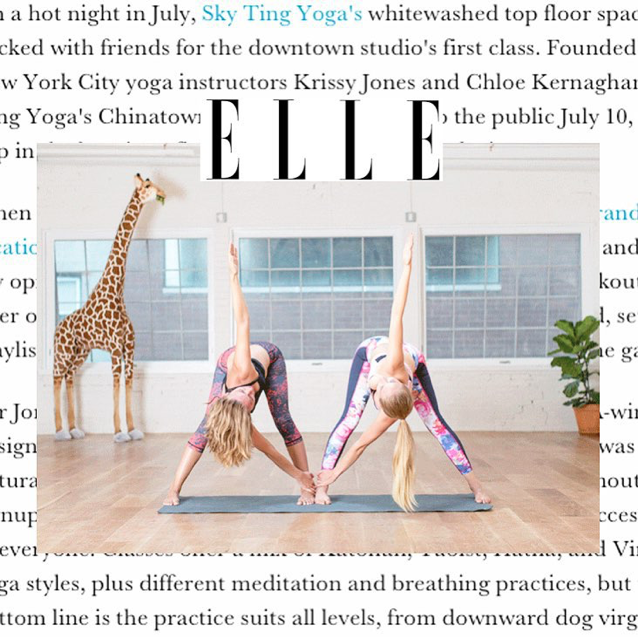 W Magazine, “SKY TING YOGA is the dreamiest with yoga angels Krissy & Chloe."